At least that’s what it was for me when I first went off the high dive back in Quantico (my hands are getting all balmy thinking about it). Of course, I couldn’t say I was scared and climb down in shame in front of roughly 200 people, so I had to jump. But as I was never good at diving I didn’t take the chance to dive or even do a flip, I just cannon-balled it. About fifteen years later it finally dawned on my why it’s always worse when you’re actually on the high dive. 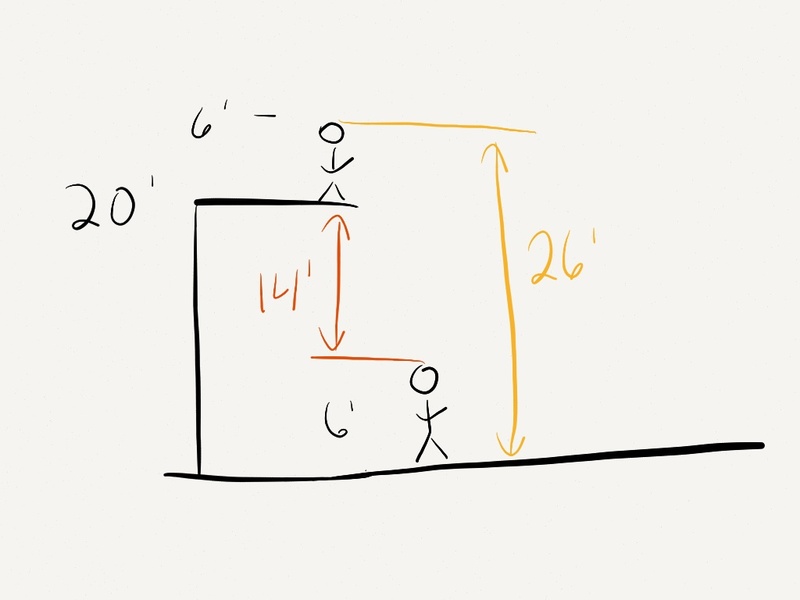 You’re 6′ tall, the board is 20′ from ground / water. For arguements sake we’ll have your eyes at the very top of your body, so when you look at the board, it’s just 14′ above you, barely twice your height. But wait, you’ve climbed the steps/ladder to the board. 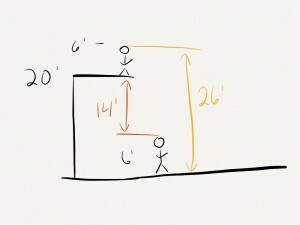 Add the 20′ for the board and your 6′ for you and now you are 26′ up, at least your eyes are and that’s how humans come up with visual perspective. Diving board perspective. Not necessarily to scale, no big deal. And I know from 10′ to 30′ the numbers work really well for the magnitude changes vs. from 50′ to 90′. But I can look at a 50′ cliff and easily say, “yeah, that’s pretty high” and not be tempted. Regardless of the height, if you go up and decide it’s not for you I would not mock you, except if it’s less than 15′ up. I mean, c’mon, it’s barely twice Shaquille O’Neal’s height! Take away: It’s called a high-dive for a reason; and for some reason I kept going up the high-dive. Extra: Drawn in Paper by 53 on my iPad by me!